The year of the Speak Now World Tour! January 3: Taylor Swift appears on the Rachael Ray Show. Check your local listings. January 5: The new Covergirl commercial makes its premiere on TaylorSwift.com at 12:00pm EST. January 5: The People Choice Awards are broadcast on CBS at 9/8c. Taylor Swift was up for Female Artist of the Year and Country Artist of the Year. Update! She won for Country Artist of the Year. 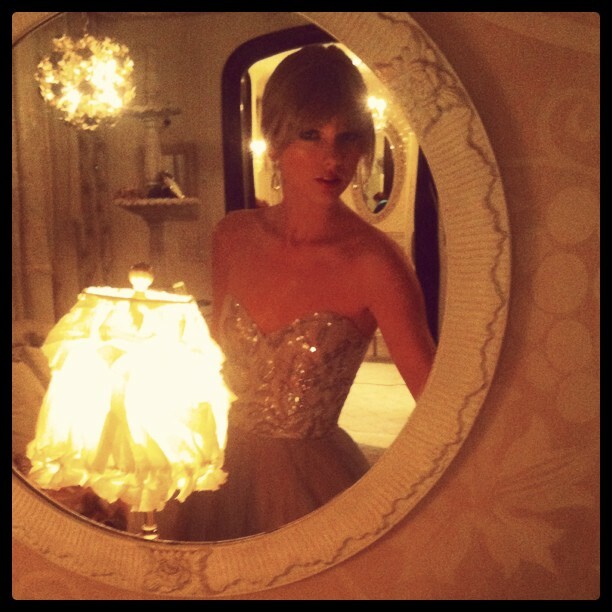 January 13: Taylor Swift’s Back To December video premiere. January 21: Taylor Swift performs on board Royal Caribbean’s Allure of the Seas Aquatheater. February 1: The 46th ACM Awards nominations are announced. Taylor is up for Entertainer of the Year, Top Female Vocalist of the Year, and artist and producer for Album of the Year for Speak Now. February 9: Speak Now tour in Singapore, Singapore at the Singapore Indoor Stadium. February 11: Speak Now tour in Seoul, South Korea at the Gymnastic Gymnasium. February 13: Speak Now tour in Osaka, Japan at Osaka-Jo Hall. February 16: Speak Now tour in Tokyo, Japan at Budokan Hall. February 17: Speak Now tour in Tokyo, Japan at Budokan Hall. February 18: Tickets for Columbus, Milwaukee, Hartford, Greensboro, Knoxville, Louisville, Charlotte, Grand Rapids, Portland, New Orleans and Lexington go on sale for the general public. February 19: Speak Now tour in Manila, Philippines at Araneta Coliseum. February 21: Speak Now tour in Hong Kong, China at AsiaWorld-Expo. February 25: Tickets for Omaha, Buffalo, Indianapolis, Tacoma and Dallas go on sale for the general public. March 6: Speak Now tour in Brussels, Belgium at Forest National. March 7: Speak Now tour in Rotterdam, Holland at Ahoy Rotterdam. March 9: Speak Now tour in Oslo, Norway at Oslo Spektrum. Sold Out. March 11: The voting for the ACM Entertainer of the Year opens in VoteACM.com. Taylor Swift is nominated. March 11: Cleveland and Chicago concert dates go on sale to the general public. March 12: Speak Now tour in Oberhausen, Germany at Konig-Pilsener Arena. March 15: Speak Now tour in Milan, Italy at Mediolanum Forum. March 17: Speak Now tour in Paris, France at Zenith de Paris. March 19: Speak Now tour in Madrid, Spain at Palacio de Deportes. March 22: Speak Now tour in Birmingham, England at the LG Arena, the Nec. March 25: Speak Now tour in Belfast, Northern Ireland at the Odyssey Arena. March 27: Speak Now tour in Dublin, Republic of Ireland at the O2 Dublin . March 29: Speak Now tour in Manchester, England at the Manchester Evening News Arena. March 30: Speak Now tour in London, England at the O2 Arena. April 2: The Kids Choice Awards airs live in Nickelodeon from Los Angeles. Taylor is nominated for Favorite Female Singer and Favorite Song for Mine. April 3: The 46th Academy of Country Music Awards took place at the MGM Grand Arena in Las Vegas, Nevada. The event aired in CBS on Sunday at 8:00pm Eastern time. Hosts: Reba McEntire and Blake Shelton. Taylor is up for Entertainer of the Year, Top Female Vocalist of the Year, and artist and producer for Album of the Year for Speak Now. 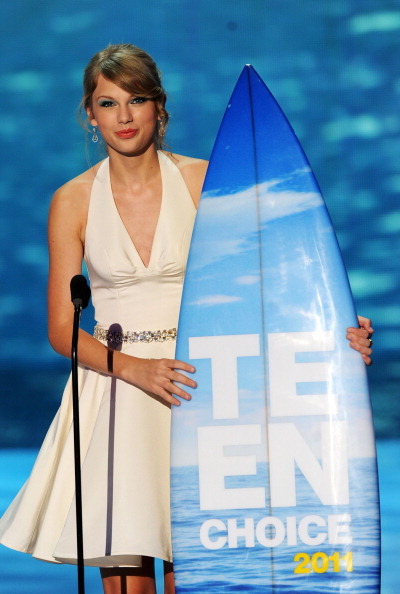 She won for Entertainer of the Year. April 5: Taylor Swift will be on Jay Leno on NBC. Please check your local listings. April 27: The nominations for the 2011 CMT Awards are announced and the voting begins. April 29: General on sale for Austin, Jacksonville and Columbia. May 6: Mean video premiere on CMT at 10/9pm after CMT Superstar. New! Also available worldwide through TaylorSwift.com NOW. May 7: Mean video premiere on CMT Canada at 5:30pm ET after Chevrolet Countdown. May 11: Taylor Swift appears on The Ellen DeGeneres Show. Check the website for a fan contest to attend and meet Taylor Swift! May 12: Tickets go on sale for the Speak Now… Help Now fundraiser for the Community Foundation of Middle Tennessee. May 12: CMT’s Disaster Relief Concert will air live from Nashville at 9pm ET/PT on CMT and will be simultaneously streamed on CMT.com. May 14: The wedding of Miranda Lambert and Blake Shelton. May 21: Speak Now… Help Now will be held at the Bridgestone Arena in Nashville, Tennessee. All proceeds go to the tornado aid relief effort. There will be a livestream event for two of her song performances on TaylorSwift.com, Ustream.tv/taylorswift, Facebook.com/TaylorSwift and MySpace.com/TaylorSwift at 9pm Central / 10pm Eastern / 7pm Pacific. May 22: The Billboard Music Awards 2011 air live on ABC at 8pm ET/ 5pm PT. May 24: The video premiere of Story Of Us on MTV First: Taylor Swift at 7:53pm ET. May 27: Speak Now tour in Omaha, Nebraska at Qwest Center. May 28: Speak Now tour in Omaha, Nebraska at Qwest Center. May 29: Speak Now tour in Des Moines, Iowa at Wells Fargo Arena. May 30: Taylor Swift to perform Mean on The Ellen DeGeneres Show. June 2: Speak Now tour in Ft. Lauderdale, Florida at Bank Atlantic Center. June 3: Speak Now tour in Ft. Lauderdale, Florida at Bank Atlantic Center. June 4: Speak Now tour in Orlando, Florida at Amway Center. June 7: Speak Now tour in Columbus, Ohio at Nationwide Arena. June 8: Speak Now tour in Milwaukee, Wisconsin at Bradley Center. June 8: The 2011 CMT Music Awards take place in Nashville, Tennessee. Vote for Taylor! June 9: The CMA Music Festival starts in Nashville, Tennessee. June 9: Taylor Swift will perform at the Concert 4 NYC hosted by the Black Eyed Peas in Central Park. Update: Cancelled due to weather! June 11: Speak Now tour in Detroit, Michigan at Ford Field. June 12: The CMA Music Festival closes in Nashville, Tennessee. Taylor Swift performs! June 14: Speak Now tour in St. Paul, Minnesota at Xcel Energy Center. June 15: Speak Now tour in St. Paul, Minnesota at Xcel Energy Center. June 18: Speak Now tour in Pittsburgh, Pennsylvania at Heinz Field. June 21: Speak Now tour in Buffalo, New York at HSBC Arena. June 22: Speak Now tour in Hartford, Connecticut at XL Center. June 25: Speak Now tour in Foxborough, Massachusetts at Gillette Stadium. June 26: Speak Now tour in Foxborough, Massachusetts at Gillette Stadium. June 30: Speak Now tour in Greensboro, North Carolina at Greensboro Coliseum. July 1: Speak Now tour in Knoxville, Tennessee at Thompson-Boling Arena. Sold Out. July 2: Speak Now tour in Louisville, Kentucky at KFC Yum Center. Rescheduled for October 11. July 3: Taylor Swift: Behind the Video “Mean” at 9/8c on GAC. July 8: Speak Now tour in Charlotte, North Carolina at Time Warner Cable Arena. Rescheduled for November 16. July 9: Speak Now tour in Atlanta, Georgia at Phillips Arena. Rescheduled for October 1. July 10: Speak Now tour in Atlanta, Georgia at Philips Arena. Rescheduled for October 2. July 14: Speak Now tour in Montreal, Quebec, Canada at the Bell Center. Sold Out. July 15: Speak Now tour in Toronto, Ontario at Air Canada Centre. Sold Out. July 16: Speak Now tour in Toronto, Ontario at Air Canada Centre. Sold Out. July 19: Speak Now tour in Newark, New Jersey at Prudential Center. Sold Out. July 20: Speak Now tour in Newark, New Jersey at Prudential Center. Sold Out. July 23: Speak Now tour in Newark, New Jersey at Prudential Center. Sold Out. July 24: Speak Now tour in Newark, New Jersey at Prudential Center. Sold Out. July 28: Speak Now tour in Grand Rapids, Michigan at Van Andel Arena. Sold Out. July 29: Speak Now tour in Indianapolis, Indiana at Conseco Fieldhouse. Sold Out. July 30: Speak Now tour in Cleveland, Ohio at Quicken Loans Arena. Sold Out. August 2: Speak Now tour in Washington, DC at Verizon Center. Sold Out. August 3: Speak Now tour in Washington, DC at Verizon Center. Sold Out. August 6: Speak Now tour in Philadelphia, Pennsylvania at Lincoln Financial Field. Sold Out. August 7: The Teen Choice Awards air live on Fox at 8/7c. Taylor wins five of her six nominations plus Ultimate Choice Award. August 9: Speak Now tour in Chicago, Illinois at Allstate Arena. Sold Out. August 10: The Sparks Fly video is released worldwide at taylorswift.com at 4:30 CDT. August 10: Speak Now tour in Chicago, Illinois at Allstate Arena. Sold Out. August 13: Speak Now tour in St. Louis, Missouri at Scottrade Center. Sold Out. August 14: Speak Now tour in St. Louis, Missouri at Scottrade Center. Sold Out. August 14: CMA Music Festival: Country’s Night To Rock special airs from 8pm to 11pm Eastern Time on ABC. Recorded during the CMA Fest with Taylor Swift performing. August 18: Speak Now tour in Edmonton, Alberta, Canada at Rexall Place. Sold Out. August 19: Speak Now tour in Edmonton, Alberta, Canada at Rexall Place. Sold Out. August 23: Speak Now tour in Los Angeles, California at the Staples Center. Sold Out. August 24: Speak Now tour in Los Angeles, California at the Staples Center. Sold Out. August 27: Speak Now tour in Los Angeles, California at the Staples Center. Sold Out. August 28: Speak Now tour in Los Angeles, California at the Staples Center. Sold Out. September 1: Speak Now tour in San Jose, California at the HP Pavilion. Sold Out. September 2: Speak Now tour in San Jose, California at the HP Pavilion. Sold Out. September 3: Speak Now tour in Sacramento, California at Power Balance Pavilion (formerly ARCO Arena). Sold Out. September 6: Speak Now tour in Portland, Oregon at Rose Garden. Sold Out. September 7: Speak Now tour in Tacoma, Washington at Tacoma Dome.Sold Out. September 10: Speak Now tour in Vancouver, British Columbia, Canada at Rogers Arena. Sold Out. September 11: Speak Now tour in Vancouver, British Columbia, Canada at Rogers Arena. Sold Out. September 13: Taylor Swift appears on the Ellen DeGeneres Show. September 16: Speak Now tour in Nashville, Tennessee at Bridgestone Arena. Sold Out. September 17: Speak Now tour in Nashville, Tennessee at Bridgestone Arena. Sold Out. September 19: 5th Annual ACM Honors. Taylor Swift is one of the honorees. She will receive the Jim Reeves International Award that recognizes outstanding contributions to the acceptance of country music worldwide. The event takes place at the Ryman Auditorium in Nashville, Tennessee. September 20: Speak Now tour in Bossier City, Lousiana at CenturyTel Center. September 21: Speak Now tour in Tulsa, Oklahoma at Bank of Oklahoma Center. Sold Out. September 24: Speak Now tour in Kansas City, Missouri at Arrowhead Stadium. September 27: Speak Now tour in Denver, Colorado at Pepsi Center. Sold Out. September 28: Speak Now tour in Salt Lake City, Utah at Energy Solutions Arena. Sold Out. October 1: Speak Now tour in Atlanta, Georgia at Phillips Arena. Sold Out. October 2: Speak Now tour in Atlanta, Georgia at Philips Arena. Sold Out. October 4: Speak Now tour in North Little Rock, Arkansas at Verizon Arena. October 5: Speak Now tour in New Orleans, Louisiana at New Orleans Arena. Sold Out. October 8: Speak Now tour in Dallas, Texas at Cowboys Stadium. October 11: The Journey To Fearless DVD is available on stores. You can order it on Amazon.com. October 11: Speak Now tour in Louisville, Kentucky at KFC Yum Center. Sold Out. October 13: Wonderstruck promotion tour! Taylor Swift appears Good Morning America, Live with Regis and Kelly, and at Macy’s Herald Square in New York City (in-store appearance). October 14: Lubbock, Texas at United Spirit Arena. Sold Out. October 15: Oklahoma City, Oklahoma at City Arena. Sold Out. October 18: Wonderstruck promotion tour! Sephora – Glendale, CA (in-store appearance). October 20: San Diego, California at Valley View Casino Center. Sold Out. October 21: Phoenix, Arizona at Jobing.com Arena. Sold Out. October 22: Phoenix, Arizona at Jobing.com Arena. Sold Out. October 29: Speak Now tour in Lexington, Kentucky at Rupp Arena. Sold Out. November 5: Houston, Texas at Minute Maid Park. November 6: The HALO Awards air on Nickelodeon. Taylor Swift is one of the presenters. November 9: The 45th Annual CMA Awards will air live from the Bridgestone Arena in Nashville, Tennesse at 8pm EST on ABC. Taylor Swift is nominated for Entertainer of the Year, Album of the Year for Speak Now, Female Vocalist of the Year, and both Song of the Year and Video of the Year for Mean. Update! She won Entertainer of the Year and performed Ours. November 11: Jacksonville, Florida at Jacksonville Veterans Memorial Arena. Sold Out. November 12: Tampa, Florida at St. Pete Times Forum. November 13: Miami, Florida at American Airlines Arena. November 16: Speak Now tour in Charlotte, North Carolina at Time Warner Cable Arena. Sold Out. November 17: Raleigh, North Carolina at RBC Center. Sold Out. November 18: Columbia, South Carolina at Colonial Life Arena. November 20: Taylor Swift appears on 60 Minutes at 7pm ET. November 20: The 2011 American Music Awards live on ABC at 8|7c from the Nokia Theater in Los Angeles, California. Taylor Swift is nominated for Artist of the Year, Country Music Favorite Female Artist and Country Music Favorite Album. She is also scheduled to perform. November 21: The Speak Now World Tour CD+DVD is available in stores. November 21: New York, New York at Madison Square Garden. Sold Out. November 22: New York, New York at Madison Square Garden. Sold Out. November 29: The taping of the CMT Artists Of The Year event honoring Jason Aldean, Kenny Chesney, Lady Antebellum, Brad Paisley and Taylor Swift. It airs December 13. November 30: The Grammy Nominations Concert takes place live at the Nokia theater in LA this Wednesday, Nov. 30, at 10 p.m. ET/PT on CBS. Taylor Swift was nominated for Best Country Album for Speak Now, Best Country Song for Mean and Best Country Solo Performance for Mean. December 2: Taylor Swift’s new video for Ours premieres on E! News and E! Online at 7pm EST. December 2: 2011 Billboard Women in Music ceremony in New York City. Taylor will receive the Women of the Year award. December 5: The American Country Awards air live from Las Vegas on the FOX network at 8/7c. Update: No wins. December 13: The CMT Artists Of The Year event honoring Jason Aldean, Kenny Chesney, Lady Antebellum, Brad Paisley and Taylor Swift airs on CMT at 9PM ET/PT. December 29: Paul Sidoti, Amos Heller and Mike Meadows along with other musicians will perform at Tequila Sunrise – A Tribute to the Eagles at the House of Blues in Cleveland, Ohio. I really wish I could go to this one, but it’s during the holiday season. Here’s the event on Facebook.